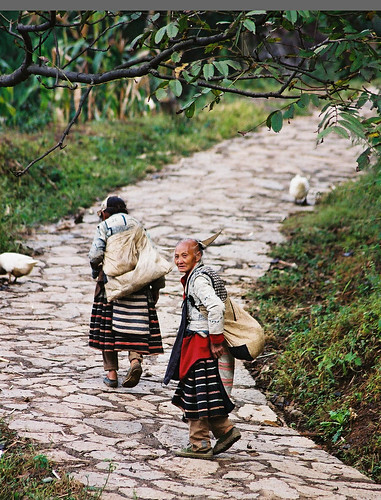 The Long Horned Miao people are an elusive ethnic group who has very little contact with the outside world. They are spread out over 12 villages up on the mountains. At the time of my visit (which was 8 years ago), there were approximately 3000 of them left in China. It's easy to distinguish them from the other branches of Miao because the women tend to wear a wooden horn on the back of their heads. On special occasions, they would drape these extremely long locks which are a combination of theirs and their mother's or ancestor's over the horn. One young girl at the village revealed that these days, they tend to use wool. I first found out about the Long Horned Miao whilst watching the Lonely Planet video on South West China. I was mesmerized by their voices, singing to each other during the courting festival, otherwise known as Tiao Hua Po. The only problem was trying to find them. Since I wasn't particularly keen about joining a tour, I was going to have to do tons of research in order to find out the directions to the town closest to the village of Longga. When we got to Anshun, a city in Guizhou province, the porter at the hotel thought we were mad and couldn't understand why we'd come to this poor and godforsaken place. The sweet guy must have warned us a million times to keep our valuables hidden. I went around asking the locals for directions to Longga. No one knew much about the Long Horned Miao but humored us since we were mad foreigners. In the end, we had to get on this old rusty and rickety bus chugging at 100 miles an hour along a treacherous road going up the mountain. There were a few hair-raising moments when I thought we were going to fall right off the cliff. Well, I guess the Health and Safety practice that everyone bleats on about in the UK is not a concern here. A young girl sitting behind us finally plucked up enough courage to approach us when again, we had to ask around for directions to Longga. 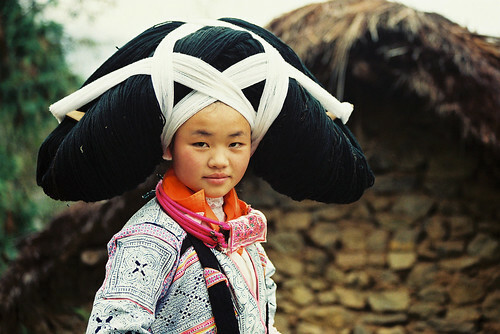 She was a Long Horned Miao from the village of Longga. The trek up to the mountain while lugging a couple of backpacks and a tripod is not for the faint-hearted. I later found out an easier way to get up there. Oh well, at least I burned some much needed calories! The two Chinese officials stationed at the guesthouse were not pleasant folks. They smiled a lot but behind the facade, they were cunning and rather crafty. I'd pretended I couldn't speak much Mandarin to find out what trickery they'd laid in wait for us. The locals at the village actually looked fearful of these Chinese representatives. They'd made a pact with the chief of the village to force visitors to purchase things from him. I guessed they'd split the money from the sale between themselves. What I didn't realize at the time was, they didn't want us to talk to the locals by ourselves so they promptly locked us in the gated guest compound. The next morning I made my escape by climbing up the fence and leaping off from the elevated terrace. A lady invited me in for breakfast. The harvested corn were stored on the beams under the ceiling. The family of 4 (ethnic minorities are allowed to have 2 children) were crammed into a small mudhouse, no bigger than my bedroom with a small coal pot doubling as a stove. It was also mind numbingly cold since we were on the mountains with dense mist shrouding the village early in the morning. Later, they shyly took out their daughter's old dress made of hand-spun cotton and individually designed batik and offered it for sale. The embroidery on the apron was exquisite. I was told that it had taken her a few years to complete both the top and apron. I didn't have the heart to bargain all that much and we agreed on NZD $75/£35. That money would've lasted them several months. The stark poverty at the village was a sharp contrast to the comfortable quarters of the Chinese officials. At the end of our stay, the Chinese guy offered to take us down the mountain followed by lunch. He promptly charged us a fortune for the "free" ride and expected his lunch to be paid as well. Thanks, Mi. They're tiny people. I'm very tall compared to them. Imagine that! I read about the history of the wooden horn which used to be buffalo horn. Something quite significant to do with a battle. I'll try to find that book again.